Do you have a PR Department, a Marketing Department, an SEO Team, a PPC Crew and just kicked off a Social Media Team? For huge companies this is a way of running a business, or they outsources some of these efforts. Medium size companies usually break things out this way too, and smaller businesses tend to lump everything onto 1 or 2 people due to lack of resources to handle it all. While making departments is definitely a great idea, and putting highly specific skill sets together to make a department or team is a wise thing to do, it can be an instant killer to a great online media marketing strategy if each one of these areas are a “silo” that operates in their own vacuum. So many times I’ve seen this happen with companies. The Public Relations team thinks they own things, the Marketing Team controls some part of a budget and then the online marketing folks really have no control over anything, or have no clue what the PR team has planned event wise. That social media team is too new to even understand they are part of the marketing budget as well. When things like this happen, it only spells one thing – disaster. By separating out each piece of this marketing puzzle, and putting each into its own silo, a company is doing itself a big disservice. Regardless of how each piece of this puzzle thinks of itself, it’s all part of marketing it doesn’t matter if its offline or online. Each piece understands its particular specialty much better than the others can understand its inner workings. For example you wouldn’t want a PPC person planning your Public Relations events or your PR person bidding on your PPC campaigns. But what you do want is your PR department letting your PPC team know that there’s an event they are planning that they need to get the word out about, or that your PPC team has just found a great niche to work with that they know your PR Team can really use that information to market some events to. When you start looking at online marketing and what you need to do to be successful in it, you have to pull everyone who has some sort of stake in how your company is perceived into the mix. Marketing and PR Departments need to be part of the planning, not just because “they were there first”, but because they have to be brought into the new media way of thinking about how companies need to reach and converse with audiences. The old way of just “pushing” marketing onto audiences doesn’t work the way it did before the advent of the internet, blogs and social media sites. Communicating with these areas requires the special talents of a Social Media Champion, having these efforts found requires both a great SEO and PPC team. Knowing what to say and how the company wants to represent itself is part of Marketing’s job but they need to work with Social Media, SEO and PPC that everything is cohesive. Promoting what the company is doing is what PR does best, but these days you can just slap up a press release and think it’s going to go somewhere, that’s where working with the Social Media & SEO teams can come in and make these events shine on the internet. One of the great keys to creating a successful online strategies is to get all of these teams working together. You need to get each one understanding that they cannot operate in a vacuum anymore. 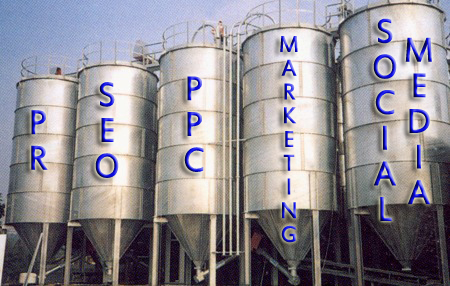 Siloing information in today’s new marketing world isn’t good for your company or the people working on these teams. Each team has to understand that they are very important to one another, that success cannot be obtained unless they understand how each piece of the new marketing puzzle fits together. If you are a company operating in this siloed manner, you might want to stop and rethink your strategy – what’s more important your success online, or feeding the egos of the departments that are siloed? The survival of your company in these tough economic times isn’t going to ride on someone’s ego, its going to ride on successful teamwork! This entry was posted in Social Media and tagged marketing, Offline Marketing, Online Marketing, ppc, pr, Public Relations, SEO, Social Media by Liana "Li" Evans. Bookmark the permalink.